These days, with 3.8 million apps in the Google Play Store and 2.1 million in the Apple App Store (according to Statista), it seems like every business has developed their own app. Even your local bakery shop may be getting in on the action. But why has mobile app development become such a crucial element in the transformation of some businesses? How does it impact businesses and what do you need to develop an outstanding application? Read on for a complete guide to mobile app development that we compiled just for you here at Sneakers Agency, New York City (NYC). Receive periodic mobile app development tips & insights straight to your inbox. First of all, let’s take a look at some facts about this market, according to Statista. The number of available mobile apps in the Google Play and Apple App Store respectively reached 3,849,865 and 2,030,483 by the 1st quarter of 2018. 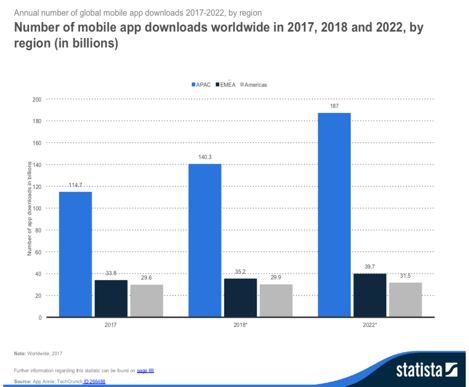 The number of downloads worldwide in 2018 is 205.4 billion and it’s predicted that it will grow to 258.2 billion in 2022. In the iOS and Android mobile market, the top three popular categories are Games, Business and Education. By 2017, the average time U.S mobile users spent on mobile was 5 hours a day according to research by Flurry Mobile. This demonstrates that there is still a huge opportunity for businesses in this space. Mobile app development has shown that it can transform numerous businesses as it provides a superior user experience. New York City, New York. New York City, New York. NYC. However, the question remains: is a mobile product necessary for every business? The answer is unequivocally NO. Mobile app development is not a low cost service and there are a few steps you must take before starting. First, you should have a business model, which means you should have an understanding of your business by identifying business goals, creating a revenue strategy, and researching your target customer base. Second, you need a marketing strategy. Once you release your app to the world, no one will know about it unless you've done your homework and figured out how to market it. And finally, you need to secure financing. A large majority of startups barely launch their app and if they do they can't afford to sustain it because they did not raise enough money. Many businesses just start developing their application, but always keep in mind that You’re Not Making an App. You’re Building a Business. And so we’d like to talk about apps in combination with business and why you should consider developing one for your own company. As we mentioned above, business is customer-centric. In today’s digital era, the best applications have solidified an approach for interacting and engaging with their customers. Companies can provide value to customers with loyalty programs or digital rewards through their applications. This is a great overall app development approach to win loyal customers. Engaging with customers can help companies improve their overall image and enhance their brand visibility. Mobile apps provide an easier direct way for customers to get to know your brand. In fact, think of a mobile app as being almost like a billboard sign. If you have one with great branding, design and features, it will definitely increase your brand awareness. Today’s younger generation of customers are obsessed with social media. If you want to be a part of their obsession, you should definitely develop an app. For instance, If you develop an app that has content that can be shared on social sites, customers will be able to discuss and talk about your product or service with their network of friends and family. Also, if you have a feedback feature in your mobile application, it will help you connect with both your loyal or potential customers who actually care about your product and service and which helps you improve your business overall. Apps and mobile app development have made boosting sales much easier than ever before for businesses. It is changing the way people review, buy or sell products. Customers prefer to purchase online or from their phones and heavily rely on word-of-mouth or social media to influence their in-the-moment busing decisions. In addition, applications can be more cost effective as compared to traditional advertising. Think about it, via in-app messages and push notifications, you have a direct line to a user and their phone. So what does success look like? What makes a great mobile app? Here is our short list of the key factors that go into creating a successful mobile app. Mobile App Success – 7 Essential Best Practices for App Development. Truly great apps don’t merely let users do things on their phones — they innovate and delight users. Mobile app development success is defined by exceeding user expectations in uniquely mobile terms. The cost of app development varies greatly. And, the price is in a constant state of flux – influenced by a number of factors including developer demand, app trends, level of complexity and the sophistication of your app idea. Take iOS as an example. Generally speaking, the average cost of an iOS app can vary from $20,000 to $150,000 (see “Average iOS App Development Cost in New York – Know the Facts”). So how much should mobile app development really cost? Surveys suggest that the price range for developing an enterprise app is most often from $100,000-$500,000. The Enterprise Mobility Exchange surveyed 300 senior mobile practitioners and published ‘The Global State of Enterprise Mobility’. One finding of the survey was that the most common budget size for the next 12–18 months was $250,000–$500,000. (Read more on “The Real Costs of Building Mobile Apps: Getting Started”). App development can be pricey, but location also matters: New York City (NYC) app development prices will be different from smaller cities, for example. New York City, New York. NYC. However, it would be a mistake to think of your app development and design as a one-time cost. Creating the app is only the first step of a long journey. While your app can truly become an effective tool for your business because you can use data and usage trends to identify new features and improvements, it costs time and money to do this kind of analysis, long term planning, and product+project management. Apps are not a one time fee and there are several variables that need to be factored into the cost. Here’s a summary of how we look at costs after mobile app development--"The Real Cost of Mobile App Maintenance". In this passage, we divide the approaches into building apps by app development tools, using an app platform, and working with agencies. On one side, there are several free and useful tools of building an app such as Xamarin, Appcelerator, PhoneGap, Sencha and Ionic. These mobile centric platforms can help you save money but they also have numerous downsides. Another approach is to use what’s known as an out-of-the-box app development platform. For a lot of niche industries, there are platforms that you can use where you a pay one time fee or a monthly fee and they provide you with a branded app development experience that fits your business needs since they built their app platform to be geared for your specific industry. And finally, working with mobile dev agencies is another approach to develop an app for your business. In this scenario, you’ll be either creating separate native mobile apps for iOS and Android or using a framework such as React Native to help create your iOS and Android mobile apps and share as much code as possible. Here's a list of the 5 Best New York City Mobile App Development Companies. If you’ve ever launched an app, you know the work isn’t over just because it’s live in the app store. Sure, that’s a huge step, but now it’s time to pause and think about how to market it and gain more downloads without breaking the bank. Amiright? Well, the long and short of it is that app marketing is not easy. With app stores changing their listing layouts almost annually, it's important to know what to focus on for your app store listing and include an (Read more on App Store Preview Videos). In this day and age an app store preview video is an essential part of any app store listing since it helps users quickly see the value they will get from using your mobile app. You should also give consideration to using device specific features where possible as this makes for an overall solution that integrates nicely with your users phones. For instance, from an application development perspective, incorporating Face ID requires very little effort. Any app that already supports Touch ID will automatically support Face ID since Apple has done an excellent job of making Face ID easy to use for app authentication. Authentication is really just the start of what you can do with Face ID, however. Read more on Facial Recognition: A Mobile App Game-Changer. Please feel free to contact us at Sneakers Agency, New York City, if you have any questions about mobile app development, estimated costs, or would just like to chat more about your idea. We are a New York based mobile app development company that works on big enterprise solutions as well as startup projects. We love working with both seasoned and rookie entrepreneurs and help remove the hassle of app development. Please feel free to reach out anytime. We are more than happy to provide a quote and walk you through the various stages of our process. We would love to make your app a reality!